The St. George area of southern Utah exhibits many classic geologic features of the Colorado Plateau, including flat-lying layers of red sedimentary rock carved into buttes, mesas, and narrow canyons. However, unlike the rest of the Colorado Plateau, some of the small (less than 1,000 feet high) isolated bluffs in the St. George area are capped by black lava rock, called basalt. 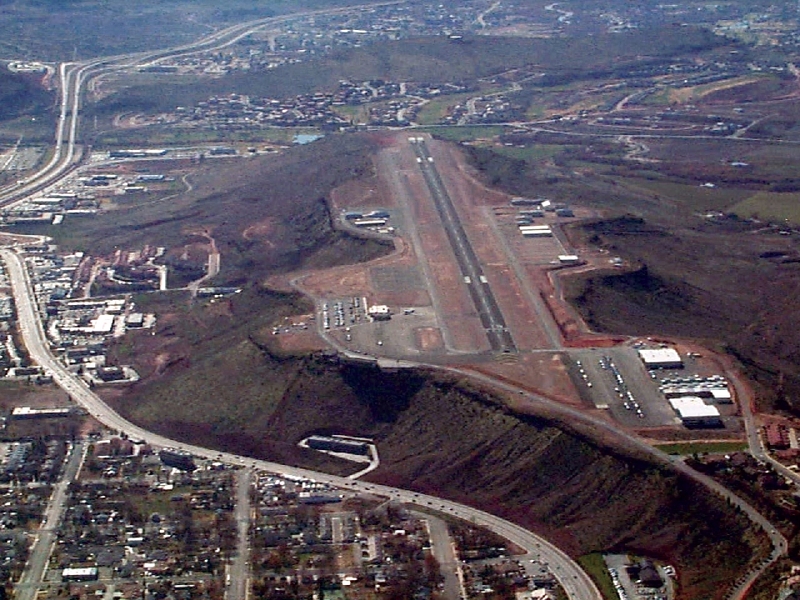 Examples include the bluff above Bluff Street (West Black Ridge, the location of the St. George Municipal Airport) and the bluff behind the outlet mall directly east of I-15 at Exit 8 (Black Ridge). The basalt on top of these bluffs originated as lava that intermittently flowed from small local volcanoes approximately 2.3 million to 20,000 years ago. Like other liquids, the basalt would flow downhill and into low areas such as stream beds, valleys, and canyons. This presents a puzzle: how does lava flowing downhill end up on hilltops? Unless it defied gravity, the lava should have flowed to low areas, not on bluff tops. And it did; the basalt that caps today’s bluffs was originally deposited in canyons and channels. However, basalt is more resistant to erosion than the surrounding red sandstone and shale. Over time, erosion lowers the surrounding red rock faster than the basalt, leaving the basalt flows high and dry – inverted topography. The bluffs in St. George above Bluff Street and behind the outlet mall are great examples of inverted topography. However, one of the best places to see that the lava originally flowed down streambeds or channels is in a road cut near Hurricane. From I-15 take the Hurricane exit (16) and travel east on State Route 9 for approximately 4 miles. The channel is exposed on the south side of the road before you reach Hurricane.